Liver dysfunction may be caused by various factors such as viruses, disease treatments, alcohol use, and metabolic or autoimmune diseases. 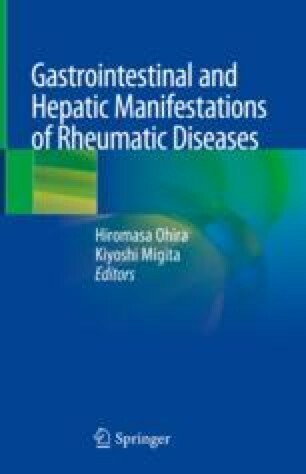 The associations between rheumatic diseases and the liver are complex, because rheumatic diseases target multiple systemic organs, including the liver. In addition, both treatment with immunosuppressants and secondary viral infections can cause liver dysfunction. Although liver dysfunction in rheumatic diseases is usually mild, liver failure has been reported in some cases. Therefore, understanding the characteristics of liver failure that may occur with different rheumatic diseases is essential for the treatment of these diseases. Clinicians must consider and treat liver dysfunction in patients with a rheumatic disease with both disorders in mind. Hirohara J. National surveys of primary biliary cirrhosis (PBC) in Japan. Annual Report of the intractable Liver and Biliary Diseases Study Group of Japan. Japanese Ministry of Health, Labour and Welfare. 2016;59–65. (Japanese). https://mhlw-grants.niph.go.jp.